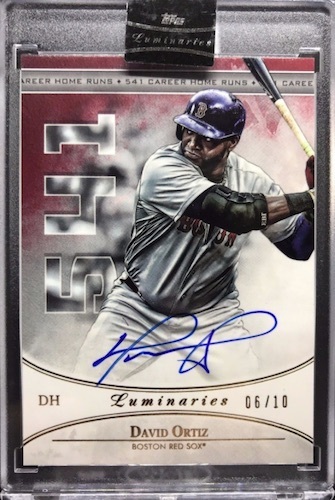 Pushing further up the high-end scale, 2017 Topps Luminaries Baseball is a new, super-premium brand that features a one-card-per-box format. Of course, each card is encased and numbered to 15 copies or less. A hobby-only release, the 2017 Topps Luminaries Baseball checklist promises "the best the diamond has ever seen...yesterday, today and tomorrow." Split into two main options, collectors can expect 2017 Topps Luminaries Baseball to deliver either an autograph or autograph relic in every box. Signed options without the added memorabilia piece include Hit Kings Autograph, Home Run Kings Autograph and Masters of the Mound Autograph sets, each numbered to 15. All three lines also offer Red (#/10), Blue (#/5) and Black (1/1) parallels. The HR-themed insert goes a step further with one-of-one Home Run Kings Ultra Book Autograph cards featuring top sluggers, and the staggering 50-player Home Run Kings Ultra Book Autograph (1/1). Other multi-player booklet autographs include Hit Kings Ultra Book Autograph (10 players; 1/1), Hit Kings Ultimate Book Autograph (40 players; 1/1), and Masters of the Mound Ultra Book Autograph (10 players; 1/1). Naturally, The Greatest Book Autograph card highlights signatures for 30 of the best on a one-of-one card. The autographed relics in 2017 Topps Luminaries Baseball mainly keep to the previous themes, but with gear incorporated. Among the choices are the Hit Kings Autograph Relics, Home Run Kings Autograph Relics and Masters of the Mound Autograph Relics inserts. Again limited to 15 copies, every set also has Red (#/10) and Black (1/1) parallels to go along with a Patch (#/5) and Black Patch (1/1) version. Booklets cards extend to the auto relics, as well, with one-of-one Home Run Kings Autograph Patch Dual and Triple Book cards. There are also Hit Kings Autograph Patch Dual Book (1/1) and Masters of the Mound Autograph Patch Dual Book (1/1) inserts. Closing out the expensive product are one-of-one Cut Signature, Cut Signature Relics and Cut Signature Bat Knob Book cards. 2017 Topps Luminaries Derek Jeter Hit Kings Auto 2 Color Patch #3 5 SSP RARE!! View available 2017 Topps Luminaries cards on eBay. 50 cards. Serial numbered #/15. PARALLEL CARDS: Red #/10, Blue #/5, Black 1/1. 38 cards. Serial numbered #/15. 23 cards. Serial numbered #/5. 1 card. 10 signatures. Serial numbered 1/1. 1 card. 40 signatures. Serial numbered 1/1. 54 cards. Serial numbered #/15. 30 cards. Serial numbered #15. 21 cards. Serial numbered #/5. 1 card. 50 signatures. Serial numbered 1/1. 94 cards. Serial numbered 1/1. 17 cards. Serial numbered #/15. 1 card. 30 signatures. Serial numbered 1/1. 72 cards. Serial numbered 1/1. 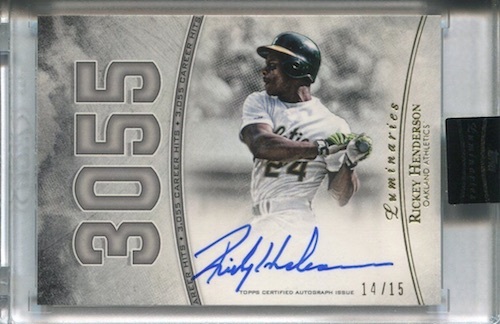 Good: Only hard-signed or cut signature cards; no print runs above 15; pretty strong checklist. Bad: Very expensive format for just one card; a few too many rookies/young players for this price; oversized numbers clutter the design somewhat. 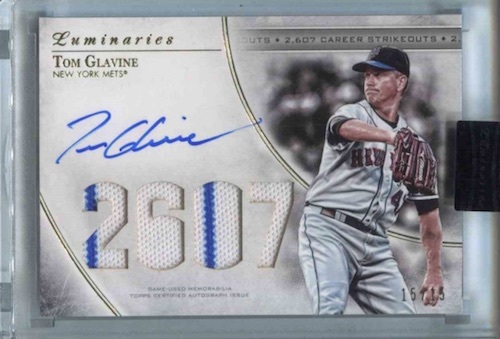 The Bottom Line: Although the price point rules out many collectors right off the bat, 2017 Topps Luminaries provides mostly Hall of Fame talent in the form of very low-numbered autographs. Although $200 for a single card is incredibly steep, the quality piece waiting inside the box can be tempting. I realize that Topps was trying to make Luminaries more distinct with the specific numbers incorporated into the design for each player. I applaud the effort for taking a theme to the next level, but I do feel it detracts from the look a slight bit and that is amplified since it extends to the whole product. Nevertheless, the specific reference can be a cool milestone keepsake for a collector. It does get a little more suspect when talking about rookies or other current players where the numbers could be outdated as soon as next season. Perhaps there should have been a different option used for these compared to the retired subjects. While very rare, there are also some insane booklet cards, including multi-panel cards with 30, 40 or 50 signers. Even the presentation is high-end with a large, sturdy box holding the encased card. This all adds to the experience. As mentioned, the quality of the 2017 Topps Luminaries Baseball checklist is pretty solid. It does result in very limited overall coverage, but that is not a bad thing for a product like this. One main issue is the inclusion of current players that don't fall into the superstar category. I'm talking about options such as Lucas Giolito and Trevor Story. Pulling one of those names from Luminaries is a tough pill to swallow. There is definitely value to be had from Luminaries, but at around $200 per box (at the time of this review) that is much more difficult. This is especially true since a majority players, even some of the bigger names, have been selling for less than the cost of the box. Therefore, most collectors would be better off just buying the card they want. However, because this is such a limited product, prices could move quickly as supply dwindles, so that is something to be aware of for those looking into singles. This is clearly a quality set. Pulling a first-ballot Hall of Fame player, with an on-card autograph numbered to five copies, is hard to not be excited about. $200-excited, perhaps not, but the enjoyment factor is still there. Topps Luminaries another high end box no one can buy unless the have a buying group. Us average collectors can’t afford these high end cards. 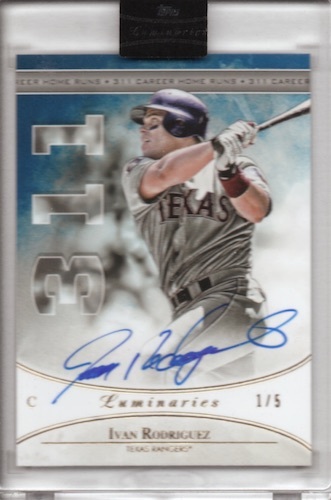 I didn’t buy topps dynasty before and I wont buy topps luminaries either. Also Topps Stadium Club had inserts Luminous and Luminescent. Its unfortunately “looming” how topps handles things these days :/ I don’t know if I’m the only one, but I do get a kick out of watching live personal breaks for Dynasty of people getting hosed lol? What did Paul Molitor do to make Topps hate him so badly this year? Was there any thought when putting together the categories, and the players making them up? Dansby Swanson is a “Hit King”? LOL That’s just an example. Crazy. Another high end product that the average collector can not afford. Only being back in the hobby a little over a year , this product has shown me why I may be out of the hobby again soon. This has truly become a lottery with an insanely expensive ticket. Unnecessary. Typical “high-end” crap. How does one differentiate between Five-Star, Luminaries, Dynasty, etc.? The designs are similar, the description of hits is similar, and the price points are meant solely to drain pocketbooks or enrich breakers. Yes a bit pricy but the checklist is small and has mostly good players and all are #’d to 15 or less. Got a K. Bryant auto relic /10 in mine. You can buy many boxes of a lower price item and not get anything #’d like these. If you can’t differentiate between Five Star and Luminaries you probably shouldn’t be spending money on this anyway. The overall odds of a great hit are high in this with tons of legends and great players. The price is probably still too high, as are all products across the board – hence I took away 1 star from an otherwise great product. Just because you can’t afford it doesn’t make it a bad product….. Unacceptable to have $200 boxes have a single $5 auto of Trevor Story and other mediocre players. Topps once again not paying attention to it’s collector base. Stay away from this one. Home Run Kings, and I don’t see Barry Bonds, but I see Big Mac, Canseco, Juan Gon, Raffy Palmeiro, etc…What a moronic bunch of names to put under HR Kings. Bernie Williams, I think of HR King when I think of Bernie. I simply can not give this a 5 stars because of the checklist. I simply can not bag this product with a 1 star because of the checklist. I feel there’s little choice but to give this the 3 star rating its almost begging for. The price is what it is. All things considered, you can spend equal amounts on multiple different hobby boxes and expect about the same result. There are obviously some monster hits to pull here. There’s also a good amount of $175 fluff. We all have our own different and preferred ways/strategies when it comes to scratching our itch when it comes to collecting cards. Every pack, every box, every case is an opportunity to find that something special we’re looking for. How much time you spend, how many cards you have to sift through, and how much money you end up spending before you actually find that something special is up to you, lady luck, and your budget. If money wasn’t an object, I still couldn’t see myself buying much of this stuff. Not that it lacks quality or is somehow flawed. It’s just the expectations and results of my time and money that makes this average to me. Plus, a single pack containing a single card should never allowed to called or sold as a hobby “box” – no matter how awesome the card inside may be. I’d hate to be left wanting after spending this much dough and feel anything less than satisfied when I was done opening it up. The bottom line – If collecting rare and valuable high-end cards are your thing, there are many less foolish ways of doing so than to blindly buy them 1 at a time like this.